From the Shetland Islands to the Azores, i.e. from the UK to Portugal, marine biodiversity conservation is a key national concern addressed particularly by the creation of Marine Protected Areas. There is a vast range of tools, approaches and goals behind the acronym "MPA" which need to be understood. 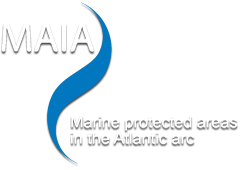 MAIA partners aim to enhance and share their wealth and differences to facilitate mutual understanding and foster the development of an efficient, coordinated and recognized network of marine protected areas in the Atlantic arc. Contributes to the emergence of a network of MPA managers. The project is broken down into 4 technical working groups or ‘Work packages’ (WP), as they are known in Interrreg-funded projects. The project also involves extensive communication action (WP5). Coordination tasks (administrative, financial and technical coordination) form WP6. These workshops will be attended by many stakeholders involved in MPA designation and management such as managers, scientists and sea users including fishing professionals. a GIS database with input to the geo-portal and the dynamic editorial pages. This database will be a benchmark for regular assessment of the status of marine protected areas on the Atlantic coast. Field studies conducted by partners to meet their own needs and provide input for work within the network. The development and distribution of documentary resources: field study reports, cross-sectional analyses, methodology guidelines, workshop proceedings and focus papers on MPAs. Je viens de consulter cette page, http://www.maia-network.org/homepage/the_project/goals_and_activities, je te la conseille.